Transit from town (老营/武当山) to school (南沟村) is either by bus (5元 one way) or private car (50元 one way). Travel could take between 30 to 45 minutes. Normally, students share the cost of trips to town. The nearest city is Shiyan (十堰), from town, it’s an hour bus ride. Taking the #202 and will cost 4元 and it will arrive at the Shiyan train station. 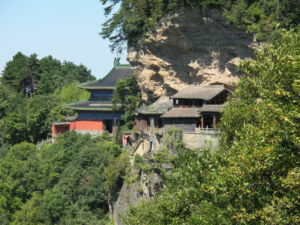 The school is about 30 minutes from the 武当山景区。Normally, a ticket up the mountain will cost 240元 per person. Sometimes, a discount is offered for children and people 65 or older. During special occasions, school trips are arranged to visit historic or spiritual sites. Visa policy varies from country to country. Anyone training in Wudang is required to obtain a student visa. If you arrive on a tourist visa it must be converted within 10 days of arriving at the school. All students are required to register with the local police station within 10 days of arriving at the school. Visa applications require an invitation letter. We can provide an invitation to the school after the deposit has been received. The nearest airports are XiangFan (XFN) and (WDS), we recommend the latter. From Shiyan you can take a bus to 武当山 for 15元 or we can arrange a car (see prices). From Shenzhen, Shanghai, and Beijing you can take a fast train to Shiyan Train Station or a slow train to Wudangshan Train Station. Bus from either train station is 4元 or less. A car can also arrange (see prices) to pick you up at either location.